This dinosaur family may be brachiosaurus, but I think of Littlefoot in the animated movie “The Land Before Time” – he was a Long Neck. One of my cousins just welcomed a new grandbaby, and she requested another dinosaur baby card. (The original dinosaur baby card is HERE .) I couldn’t make the cards the same…it took me a fair amount of time to have my epiphany. I blended the sky with a cloud stencil, then built the scene on top of that with my die cut pieces. I struggled with where to place the “new baby” sentiment and finally decided to put it on Soft Sky paper so it blended with the sky. Supplies: Stamps – Clearly Besotted, Lawn Fawn, paper – Neenah Classic Crest Solar White, Desert Storm, Stampin’ Up! Cajun Craze (I think? ), Chocolate Chip, Confetti White, Crushed Curry, Kiwi Kiss (retired), Mellow Moss (retired), Soft Sky (retired), Tangerine Tango (retired), inks – Copic E23, Tim Holtz/Ranger Tumbled Glass, VersaFine Vintage Sepia, dies – Lawn Fawn (dinosaurs, trees, stitched hillside), Simon Says Stamp (banner), embossing folder – Provo Craft, stencil – My Favorite Things, oval punch – Stampin’ Up!, embossing powder – Stampendous Detail clear. Categories: baby, card | Tags: card, Clearly Besotted, Copics, My Favorite Things, Neenah, Provo Craft, Ranger, Simon Says Stamp, Stampendous, Stampin' Up!, Tim Holtz, Tsukineko, VersaFine | Permalink. This inspired the baby boy note card last week. Supplies: Stamps – Simon Says Stamp, Stampin’ Up!, Sugar Pea Designs, paper – Neenah Classic Crest Solar White, Stampin’ Up! Bashful Blue (retired), Night of Navy, inks – Lawn Fawn Manatee, Stampin’ Up! Bashful Blue (retired), VersaFine Clair Twilight, VersaMark, dies – Spellbinders (circles, rectangle), Sugar Pea Designs (onesie), embossing powder – Filigree Fine Art Powder clear. Categories: baby, card | Tags: card, Lawn Fawn, Neenah, Simon Says Stamp, Spellbinders, Stampin' Up!, Sugar Pea Designs, Tsukineko, VersaFine Clair, VersaMark | Permalink. My card basket is lopsided on the blue to pink ratio! Add one to the blue side. I stamped the elephant in gray and embossed. I wanted it to have more loft, so I overstamped in VersaMark (clear) and embossed again. Perfect! Good thing I left the elephant stamp on the MISTI, so lining up the second stamping was a no brainer. Supplies: Stamps – Simon Says Stamp, Stampin’ Up!, Sugar Pea Designs, paper – Neenah Classic Crest Solar White, Stampin’ Up! Bashful Blue (retired), Night of Navy, inks – Lawn Fawn Manatee, Stampin’ Up! Bashful Blue (retired), VersaFine Clair Twilight, VersaMark, dies – Spellbinders (rectangle), Sugar Pea Designs (onesie), embossing powder – Filigree Fine Art Powder clear. Categories: baby, card, note | Tags: card, Lawn Fawn, Neenah, Simon Says Stamp, Spellbinders, Stampin' Up!, Sugar Pea Designs, Tsukineko, VersaFine Clair, VersaMark | Permalink. 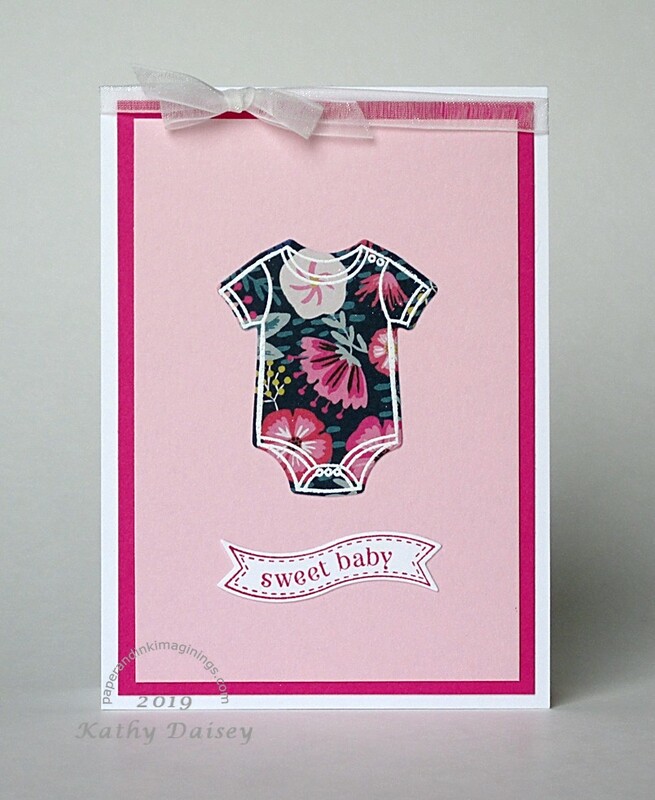 How about a floral onesie baby note card? I would have loved this navy and pink print on baby girl clothes circa Offspring3! Supplies: Stamps – Stampin’ Up!, Sugar Pea Designs, paper – Crate Paper Good Vibes, Neenah Classic Crest Solar White, PopTone Razzle Berry, Stampin’ Up! Pirouette Pink, inks – Hero Arts Unicorn, My Favorite Things Razzle Berry, dies – Stampin’ Up! (banner), Sugar Pea Designs (onesie), embossing powders – Filigree Fine Art Powder clear, white, organdy ribbon – Offray. Categories: baby, card | Tags: card, Crate Paper, Good Vibes, Hero Arts, My Favorite Things, Neenah, Offray, Poptone, Stampin' Up!, Sugar Pea Designs | Permalink. Can you see I got a new baby related die (the onesie)? There is a stamp set that coordinates with it, but I thought it would be cute to have a customized baby girl onesie today. I am working HARD on getting my inventory packaged, priced, counted, entered into multiple Excel files (gallery required one, my own) for HorseSpirit Arts Gallery delivery on Monday. Supplies: Stamps – Impression Obsession, Stampin’ Up!, paper – Neenah Classic Crest Solar White, Stampin’ Up! Basic Gray, Taylored Expressions Strawberry Milkshake, inks – Copic E21, R81, Y18, VersaFine Onyx Black, dies – Lawn Fawn (stitched rectangle), Sweet Pea Designs (onesie), embossing folder – Provo Craft, embossing powder – Stampendous Detail clear, organdy ribbon – Offray. Categories: baby, card, note | Tags: card, Copics, Lawn Fawn, Neenah, Offray, Provo Craft, Stampendous, Stampin' Up!, Sweet Pea Designs, Taylored Expressions, Tsukineko, VersaFine | Permalink. Still working my way through some baby cards. Supplies: Stamps – Reverse Confetti, Stampin’ Up!, paper – My Favorite Things Bundles of Blossoms, Neenah Classic Crest Solar White, Stampin’ Up! Rose Red (retired), inks – Copic E33, R81, R85, VersaFine Onyx Black, VersaMark, dies – My Favorite Things (pierced rectangle), Spellbinders (circles), embossing powders – Filigree Fine Art Powder clear, Stampin’ Up! Sterling Silver, silver cord – Paper Mart. Categories: baby, card | Tags: card, Copics, My Favorite Things, Neenah, Paper Mart, Reverse Confetti, Spellbinders, Stampin' Up!, Tsukineko, VersaFine, VersaMark | Permalink. Supplies: Stamps – Simon Says Stamp, Stampin’ Up!, paper – Neenah Classic Crest Solar White, Stampin’ Up! Bashful Blue (retired), inks – Copic B21, E33, Y17, Stampin’ Up! Bashful Blue (retired), VersaFine Onyx Black, dies – Lawn Fawn (stitched rectangle), Spellbinders (circles, tag rectangle), embossing powder – Filigree Fine Art Powder clear, Stampendous Detail clear. Categories: baby, card | Tags: card, Copics, Lawn Fawn, Neenah, Simon Says Stamp, Spellbinders, Stampendous, Stampin' Up!, Tsukineko, VersaFine | Permalink.